Brief Description of Subject: This is the second of the four north side nave windows based on the "Revelation." 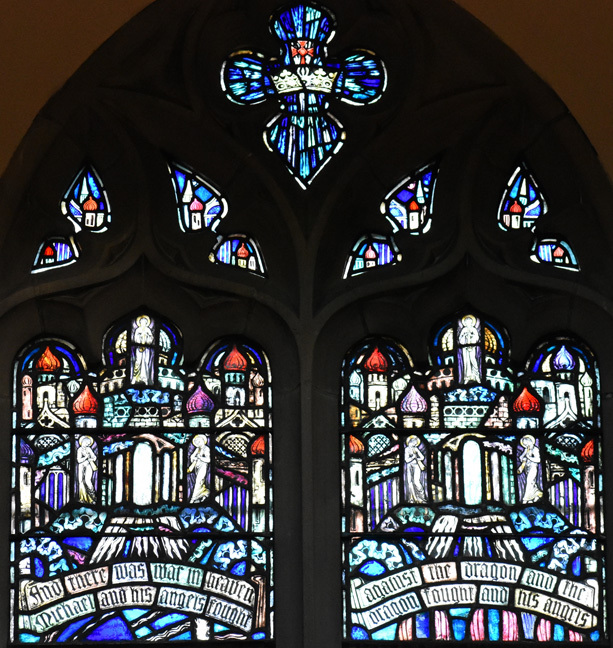 All capitalized phrases are the inscriptions found on this window, all are from the "Kings James Version" of the Bible . 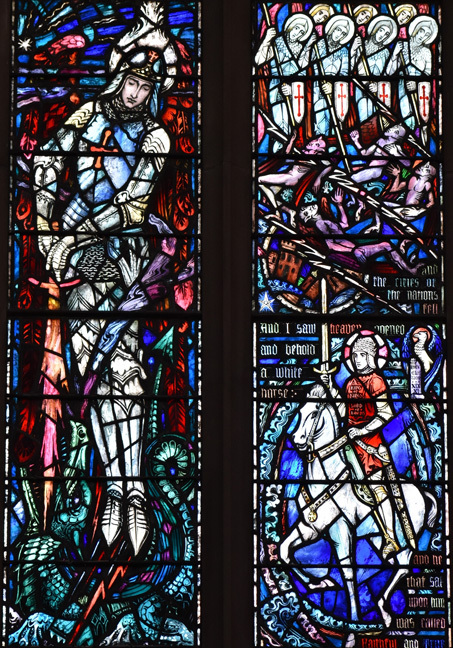 The large scene in the left lancet is "Michael Defeats the Dragon". The story as well as the inscription can be found in Rev.12:7-17. "AND THERE WAS WAR IN HEAVEN: MICHAEL AND HIS ANGELS FOUGHT AGAINST THE DRAGON; AND THE DRAGON FOUGHT AND HIS ANGELS, And prevailed not; neither was their place found any more in heaven. And the great dragon was cast out .... He was cast out into earth, and his angels were cast out with him. AND I HEARD A LOUD VOICE SAYING IN HEAVEN, NOW IS COME SALVATION, AND STRENGTH, AND THE KINGDOM OF OUR GOD, and the power of Christ." The large scene in the right lancet is actually three scenes from Revelation. The top scene is Michael's army of angels casting the fallen angels out of heaven. The middle scene comes from the story of the "Seven Bowls of God's Wrath". The story and inscription are found in Rev.16-17-21 " And the seventh angel poured out his vial into the air ... And there were voices, and thunders, and lightnings; and there was an earthquake ... AND THE CITIES OF THE NATION FELL." The bottom scene comes from the story of "The Heavenly Warrior Defeats the Beast". The scene as well as the inscriptions are found in Rev19:11-21 "AND I SAW HEAVEN OPENED, AND BEHOLD A WHITE HORSE; AND HE THAT SAT UPOM HIM WAS CALLED FAITHFUL AND TRUE, and in righteousness he doth judge and make war ... And he was clothed with a vesture dipped in blood: and his name is called Word of God. ... And he hath on his vesture ... a name written, KING OF KINGS AND LORD OF LORDS." To the right of the head of the rider is a scroll inscribed with "REVELATION XIX:XI" holding the scroll is an eagle with angel wings --- this is the symbol for John the Evangelist, ascribed writer of the "Revelation". Below the large scene is six saints, all of which, in legend, have been associated with dragons. 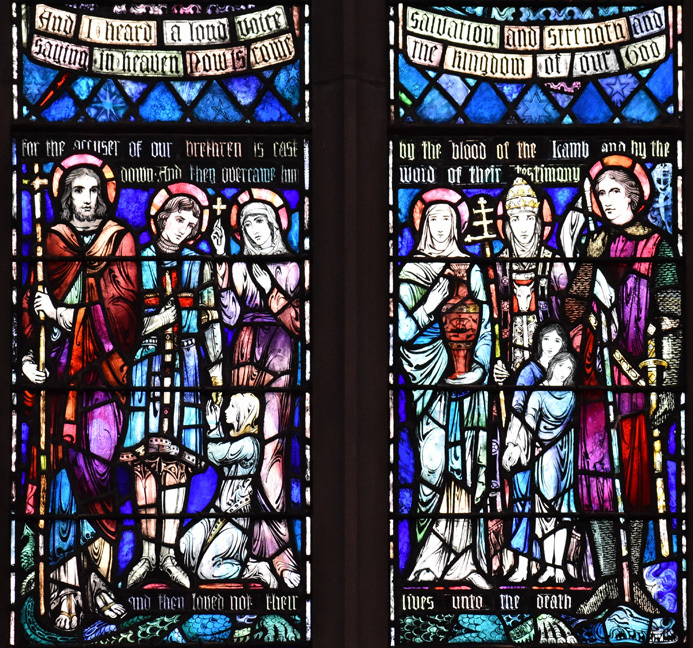 L to R: St. Theodore, St. George (at his feet is the princess he saved from the dragon), St. Margaret of Antioch, St. Martha of Bethany, St. Sylvester (children represent those saved from Constantine's plan to sacrifice them to regain his health), and St. Philip the Apostle. Underneath these is a dragon that looks like a crocodile. This probably comes from the statue of St.Theodore in Venice in which St. Theodore is standing on a dragon that looks like a crocodile. On the left side of the memorial is a shield with a balance scale with a feathered hilt --- possibly the balance scale refers to St. Michael as the one who weighs souls at the Last Judgment. The small picture on the right side of a man on horseback with a child rolling a hoop following behind him must have meant something to the donor Mrs. Theodore W. Fletcher.